Special Offer. Buy 2 Bottles for £62.50 each. A luminous colour; deep rose with hints of topaz. Coral reflections, beautifully dazzling. A fine, persistent bead with a fulfilling, appetizing bouquet. The bouquet is delectably appetizing. Initial notes evoke scents of picking ripe berries under the summer sun: forest berries, wild strawberry, raspberry and currant rounded out with floral, botanical nuances of rhubarb, violet and cocquelicot bonbons. A touch of vanilla and pink peppercorn underscore the vintage's full-fledged maturity. A warm, joyous palate. The palate evokes joy, calling to mind a carnival with its twirling rides and children laughing over displays of sweets: marshmallows, hard candy, cotton candy and caramel apples. Then come notes of nutmeg, dried fig and black cherry. The Pinot Noir expresses itself with a light, airy elegance, a soft, gentle texture and a finish. 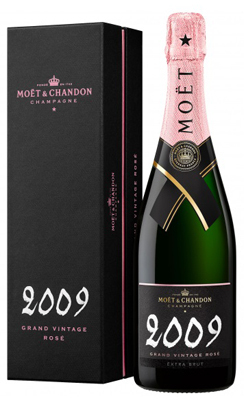 With its 42nd vintage rosé champagne, Moët & Chandon has allowed the pinot noir to take centre stage. Grand Vintage Rosé 2009's red-berry flavours are balanced by floral, botanical nuances. Created during what the cellar master called an "exceptional year”, Grand Vintage Rosé 2009 is playful and fruity, with evident maturity, backed up by an elegant, silky finish.